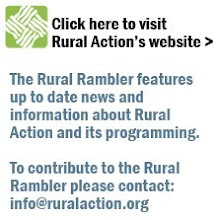 The Rural Rambler: Your World, Your Chance to Make it Better! Your World, Your Chance to Make it Better! Would you like to take a year (or a summer) to do something truly rewarding? 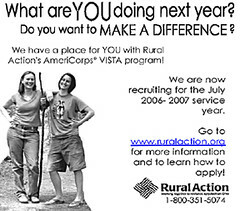 Rural Action is now recruiting AmeriCorps*VISTA members for both year-long and summer positions. The 2006-2007 service year begins July 13; the Summer Associate service term starts June 12. VISTA members work with Rural Action and its partners to address the needs of rural Appalachian Ohio. AmeriCorps*VISTA (Volunteers In Service To America) is a national service program for men and women 18 years old and older interested in developing lasting solutions to the problems of poverty in America. The positions are full-time and provide a monthly living allowance and an education award at the completion of the term of service. For more information visit www.ruralaction.org and www.americorps.org.